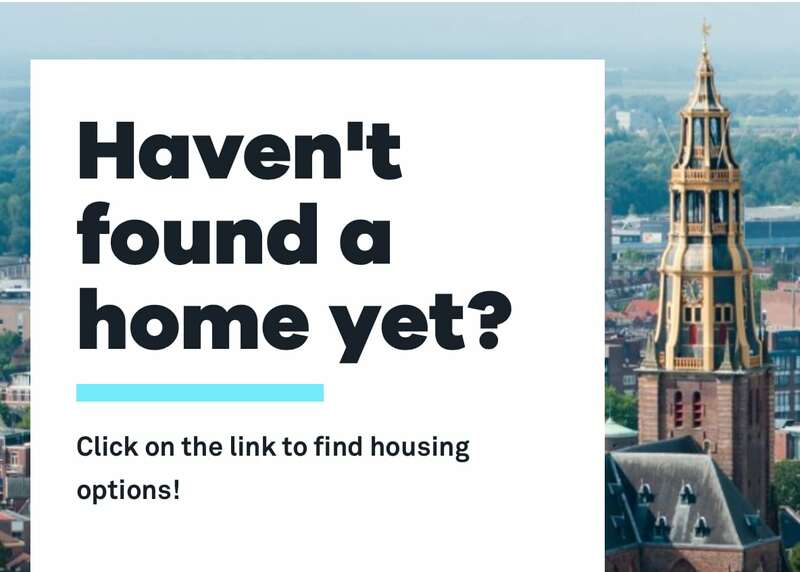 When At Home in Groningen’s room-finder launched in July, it was meant to serve as an antidote to international student’s housing woes in the city. But as the school year gets underway, there are still scores of students looking for a place to live, and the room finder’s inventory is decidedly slim. Both the quantity and quality of rooms on the finder have noticeably dipped. Of those available as of Tuesday, the 11th of September, there are five rooms listed, four of which are already reserved. Three of them are in the same place, a 50-minute bike ride away from the city. One listing is an orange caravan on a farm, and the others, including a studio, are inside a farmhouse. There’s also a room available in a very nice-sounding house in Norg (about 20km from the city), but it’s only really temporary accommodation. Although dozens of students have found rooms through resources like the room finder, there were still many internationals at both the University of Groningen and Hanze University of Applied Sciences who started classes while living in a variety of emergency accommodations. Students from a stunning range of countries were sleeping in barrack-style tents near the ACLO sports centre, but as of Monday the 10th, the tents were closed because the students there had either found a permanent place or chose to relocate to other temporary (but decidedly more solid) accommodations in a former school at the Metaallan. A number of students are still living in a hotel boat and some are even bunking in university staff members’ spare rooms. In response to the ongoing housing struggle faced by international, on Thursday evening, students occupied the University of Groningen’s Academy Building for eight hours. They publicised four demands about emergency housing and housing in general, and the way that university student numbers are linked to funding overall. The University eventually responded to all of the student’s demands, but It is important to remember (as the universities themselves stress) that no Dutch university is obligated to house its students. Universities, it is held, are solely responsible for providing an education to students: that was officially enshrined in Dutch higher education law in the 1980s. The purely academic role of the institution worked well when it primarily attracted regional and national students. But deliberate campaigns to recruit international students have been unbelievably successful, and the universities in Groningen now benefit not just from new points of view, but also from serious cash (non-EU tuition fees can be as much as four times higher than standard fees). It used to be safe to assume that incoming students were likely to have some support networks in the region and at least a passing familiarity with the Dutch rental market. But international students are unlikely to have either, and if they do not manage to secure allocated housing at one of the housing corporations (as thousands of students do), they arrive in the city to the harsh reality that the rental market is stacked against them on seemingly every level, from undersupply and hospiterento discriminatory rental listings and vulturous landlords. Both higher education institutions in Groningen have exemplary academic standings within the Netherlands and internationally. Both are standard bearers for internationalisation, with the University of Groningen in particular having broadened its horizons with 60 percent of its PhD candidates coming from abroad and 17 percent of the student population hailing from elsewhere. The answer to this perennial problem is most certainly not the cutting of international student numbers. But if this city wants to see a day that no more incoming internationals have to sleep in emergency shelters to avoid ending up on the streets, something has to give. When the giant levers of the University of Groningen, Hanze University and municipality all swing into action, serious strides can be made. At Home in Groningen’s room-finder is a promising example, but the number of available rooms still leaves something to be desired. The institutions also arranged for the free emergency accommodations this year, which is undeniably preferable to students being left homeless but still amounts to sticking a plaster on a years-old self-inflicted wound. There are plans to build between 500 and 1,000 extra housing units, including 249 mid-term (10 year) properties at the former Suikerunie factory. If all of these are realised (and reasonable quality and price),they will add badly-needed stock to the market, as will sites like At home in Groningen. Unfortunately, that prospect is of little comfort for those still in search of a place to call home.